The governor of New York referred to Trump as "un-American" in a speech Sunday. Gov. 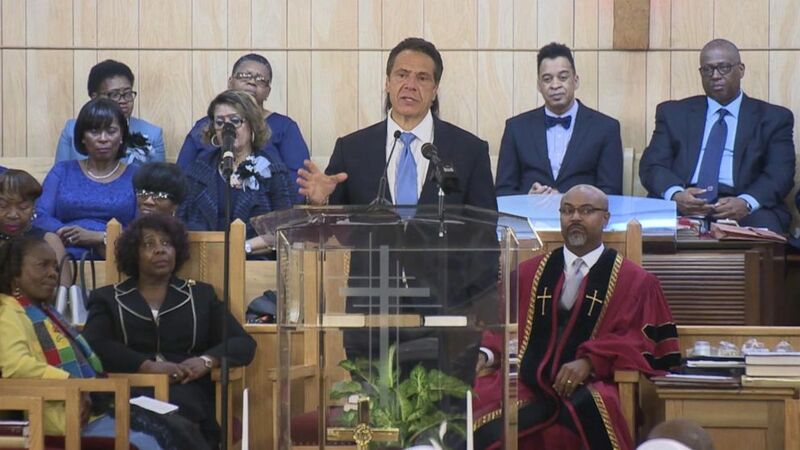 Andrew Cuomo ramped up his war of words with President Donald Trump during a political speech at a Brooklyn church on Sunday morning, calling him "King Trump" and the "great divider in chief." Standing from the pulpit at First Baptist Church of Crown Heights, Cuomo said his feud with the president "is not just politics as usual." "This debate we’re having with the president is really about the country we want to be. This is about our values, our beliefs, our character," Cuomo said. "It is a frightening portrait." “Trump’s America is one of division and intolerance,” Cuomo continued. Cuomo came under fire last week after doing a riff on Trump’s "Make America Great Again" slogan during a bill signing ceremony. "We’re not going to make America great again. It was never that great," Cuomo said. "We have not reached greatness. We will reach greatness when every American is fully engaged." Trump lambasted the governor in a tweet saying, "Wow! Big pushback on Governor Andrew Cuomo of New York for his really dumb statement about America’s lack of greatness. I have already MADE America Great Again, just look at the markets, jobs, military- setting records, and we will do even better. Andrew 'choked' badly, mistake!" Trump called Cuomo’s comment potentially "career threatening." (Win McNamee/Getty Images, FILE) President Donald Trump departs the White House, July 31, 2018, in Washington, DC. 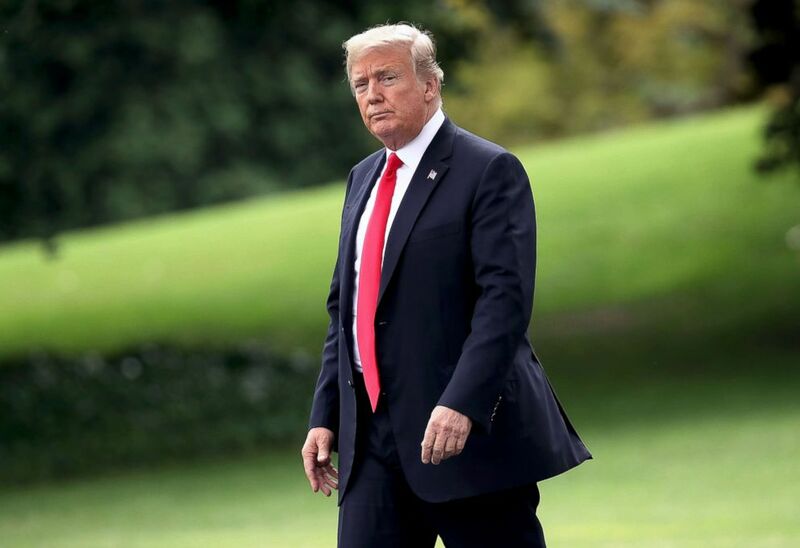 "When a politician admits that 'We’re not going to make America great again,' there doesn’t seem to be much reason to ever vote for him," Trump tweeted. Cuomo, who faces a Democratic primary on September 13 against Cynthia Nixon, later walked back his comments after widespread criticism by saying his words were "inartful." Dani Lever, a spokesperson for the governor, clarified the intention of his words in a statement. "The Governor believes that when everyone is fully included and everyone is contributing to their maximum potential, that is when America will achieve maximum greatness." But despite the stumble, Cuomo's rhetoric — specifically aimed at Trump — is part of a larger campaign strategy to set up the governor as a foil to the president in a state where his poll numbers aren't so great. A July 9 Quinnipiac poll gave Trump a negative 36-57 percent approval rating among New York State voters. “He’s taking on Trump in tough, direct, visceral language that doesn’t resort to petty name calling traps other Democrats have fallen into,” a Cuomo strategist told ABC News. Cuomo on Sunday continued to take direct aim at the White House and Trump, calling him "un-American." (Office of the Governor of New York) New York Gov. Andrew Cuomo addresses the congregation at the First Baptist Church of Crown Heights in the Brooklyn borough of New York, Aug. 19, 2018. "I believe it’s un-American to deny a young persons dream to come to college, I believe its un-American to take babies out of the arms of their mothers because they want to come to this country," Cuomo said. "I believe its un-American to put children in cages, I believe its un-American to lock up refugees." Cuomo then addressed Trump directly. "Mr. Trump, I’ve known you for 30 years you may be a slick salesman who fooled a lot of people in this country, but you didn’t fool me and you didn’t fool a lot of New Yorkers."